"About five days after event X, event Y is very likely to happen"
"A short burst in the frequency of event Z, makes it likely that also event Y will happen with an extra high magnitude"
I specifically do not want to describe what my data is about, as I am looking for a general solution to a general question. 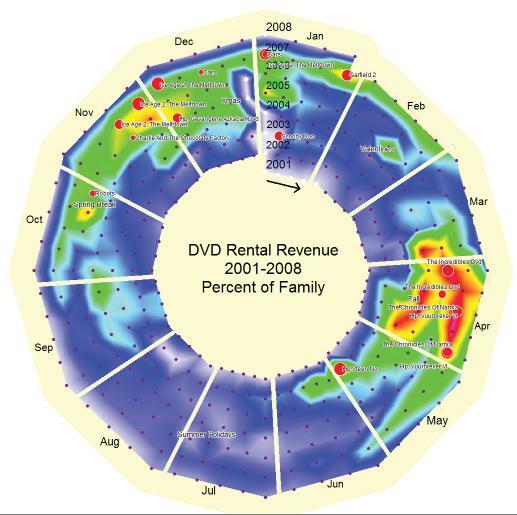 Try using a spiral heat map to visualise your data - these are excellent at helping you to spot temporal patterns. Your time dimension becomes a spiral, one rotation per year or month, and your other variables shown as a heat map. TDWI has an interview with Biz2 founder Andrew Cardno where he talks about this approach. Disclosure: Several years ago, I used to work for one of Andrew's earlier businesses. And make sure to explore the little interactions inside - for example, how on mouseover both graphs show an indication at once (instead of drawing a vertical guide connecting them). Sounds like a job for motion charts. You should watch Hans Rosling's TED talk. It's amazing. Google has an implementation that you can try out. I think visual patterns hopefully could emerge. Statistics. Time series correlation detection and forecasting is why we invented statistics. You should read about Covariance and Correlation, and Autocorrelation. You might be particularly interested in Correlograms and Covariance Mapping. Visual patterns are neat, but it's easy for the eye to believe it sees patterns where there are none, or more likely to miss a pattern that would be easily detected with some simple stats analysis. In fact, patterns that would otherwise be lost in noise or hidden in complex phase relationships can be extracted and enhanced and made visible using statistical methods. It's really hard to tell if we don't know what the data is. Like are you trying to compare 10 types of events? A hundred? Thousands? And how many data poitns per event? Thousands? Millions? This would determine what kind of visualization you can do. If you don't have a huge number of event types, I would try something like small multiples or a faceted line chart. Since you have both magnitude and intensity, you could map the magnitude to the y-dimension and then map intensity to the size of a the point that is on the chart. Time series graph that is not a Gantt Chart?